It is one of the largest, best preserved, and most compelling royal gardens in the world. The Summer Palace boasts many different garden and architectural styles of China, yet the whole is harmonious. 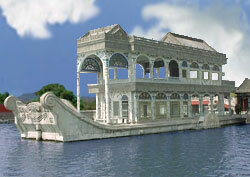 The Summer Palace's most famous object. It is neither marble nor boat. It is permanently "docked" on the lake bed next to the shore and is made of stone painted to look like marble. A covered walk that runs 728 meters (nearly a half mile) along the lake. Its ceiling and columns are lavishly painted with 10,000 different landscape and animal scenes. Gracefully shaped 200 year old marble bridge.